Homozygous is the term for a pair of identical alleles; there is no 'hidden' allele. You can remember this because homo essentially means 'all the same'. 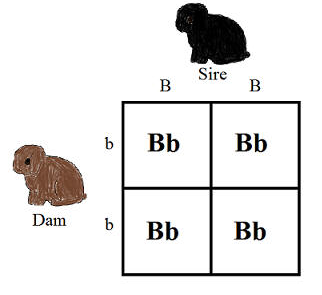 They can either be homozygous dominant or homozygous recessive. Some examples are BB, VV, and EnEn. Now, then there's heterozygous, which is when there's one dominant and one recessive allele. Because the dominant is written first, we could have Bb, Vv, or Enen. Heterozygous is also called hybrid. 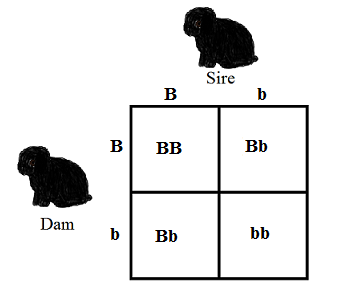 The Punnett Square is a handy little tool that helps us predict the color of our rabbits' offspring. Let's say we've got a black buck with a genotype of BB. We're going to breed him to a chocolate doe with a genotype of bb. ​We can trace each allele from each parent down to the offspring. The sire has only B to give, and the dam has only b to give, so the offspring will all be black in color, but carry the chocolate gene! Now let's see what happens if we breed two Bb rabbits together. There is a one out of four chance of the babies having a BB genotype. There's a two out of four chance of them having Bb genotype. And there's a one out of four chance of them having a bb genotype!